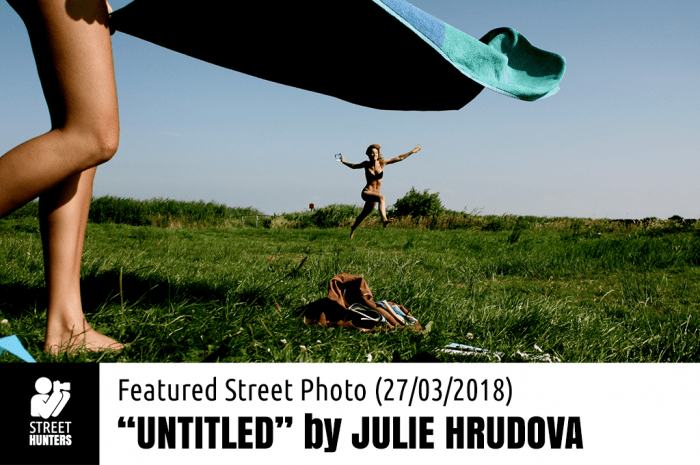 You can see more of Julie Hrudova’s photography on her Flickr at https://www.flickr.com/photos/juliehrudova/ or if you prefer her Instagram page https://www.instagram.com/hrudography/ and also on her website at http://www.juliehrudova.com/. I have to admit that Julie’s Flickr stream was full of potential candidates for “Featured Street Photo”. Even though the choice was a difficult one, I ended up selecting this one. On first glance I get the following plausible story when looking at this photograph. Three girls, on a picnic or just out in the country, possibly by a lake or river, about to chill solving crosswords and reading books while getting a sun tan. The mood is great, the girls are happy. One of them is about to put a towel down, while the other is expressing her joy by running and jumping in the background, while the third girl, our photographer, is capturing this memory with a single snap. Compositionally, the 3 layers provide a really good sense of depth to the image. Layer one is black bag and crossword, layer two is girl with towel and layer three is girl jumping. The colours are also perfect. The image is basically made of greens, blues and beige/brown with the exception of a little piece of red cloth showing through the black handbag. Another very important element that gives life to this image and sets the atmosphere of general happiness is the motion of the two girls and that of the towel. Both the jumping girl and the towel have been captured mid air giving a sense of a light-hearted feeling to the image. A carefree, playful tone is set making the image affect the viewer in a very positive way. I could really go on about this photo for hours, but I will try not to overdo it. The bottom line is that I really like it and I think it is worth being featured on www.streethunters.net! So there you have it. Excellent work Julie!